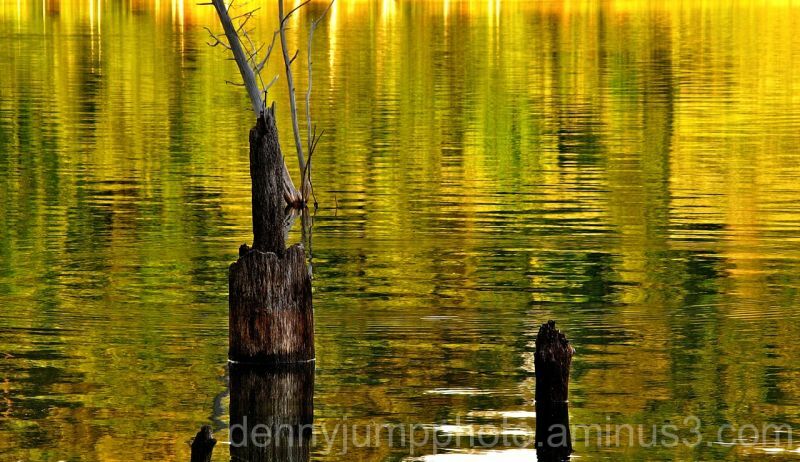 Denny Jump (Bellevue, WA, United States) on 7 August 2010 in Landscape & Rural and Portfolio. The reflections at sunset time cast a bronze, green, and golden appearance onto the water at Merrill Creek Reservoir in Warren County, western New Jersey. @Catherine: Hi and thank you Catherine - I like your unique photographs the fish - are they all solde now?? :-) Todays is a bit sobering isn't it - you do great work Catherine!! An thank you for your comment. More artistic than yesterday's image, 100% mark. @Phil David Alexander Morris: Thanks Phil!! :-) You da Man!! That's fantastic. I really love this cropped detail. It highlights the reflections and those fabulous colors. Really love it and all its textures and fine detail. Beautiful! @Bettina: Thanks Bettina - the original had too much of the light at the top and I felt it detracted, so I did away with it - I am glad you like it too. Thanks again! @Ana Lúcia: Hi Ana Lucia - Thank you fery much! Fabulous tones in the water 'On Golden Ponds' - remember the film...Henry Fonda ? @Olivier: Hi Olivier and thank you very much for your very kind remark. I realy enjoy your photos and I especially love the sunsets you recenly posted - wonderful . Thanks Again! This is very nice and feels almost painterly. You've captured the colors and light beautifully. @GJC: Hi and Thank you very much for your comment. the sunset colours reflecting on the water - absoluting stunning! This is a wonderful photo. @Scene by Sharon Photography: Hi Sharon and thank you very much. The scene was so peaceful with these colors in the water - I just had to work with it. Thanks again! More emerging trunks... When a theme is repeated, there is the risk that the first picture is the best by far, and the other mere repetitions with little variations. This is not the case. I think that this shot is absolutely fantastic! The colour tone and ssaturation are perfect in my opinion. Great job, master! @oriol: HI Oriol - Thank you very muh for your wonderful and generaous comment! I am honored! Thank you and all the best! Colors on quivering water are really tremendous, like a lot !! @Evelyne Dubos: Hi Evelyne - Thank you very much for your comment, I am grateful! That title says it well - a very good composition, Denny. @Stephen Phillips: Thanks Stephen - I really like your Bay Bridge pov today - awesome look!! @The MaJor: Hi and Thank you sir! Just stunning with the rich colors! Absolutely gorgeous! I love that golden light. @Steve Rice: Hey Steve - Thanks very much Sir...I need to catch up with everyone here - will tap into your blog momentarily - I missed it yesterday - have a great Sunday (now). I am telling you this place is magical! Really nice timing on the colors! Love this shot! Very nice light and patterns in the water. I like this. @Julie Brown: Thanks Julie - I will be honest and say I likt it too :-) I just mainly like how the water looks with all those great reflections courtesy of the evening spirits! @MARIANA: Hi Mariana - Thank you - yes it was really great looking at the water at that time - thanks again! Lovely golden reflection! You really caught it beautifully! @Barbara: Hi Barbara - Thank you very much - I sure did - pretty much everyne's comment (and mine) was abuot the colors...I was rounding a bend by the shore in a cove and it was actually facing east-ish but the setting sun was reflecting on the trees across the cove and they, in turn blended with the colors in the sky to create this beautiful reflection off the water - there you have it. ...All rights reserved" LOL, (that was my little disclaimer HA) - Seriously thanks and have a great day Barbara! this is luminous Denny...it reminds me of summers on a lake when a child. Gorgeous! Gorgeous! Gorgeous! Golden Pond. Wonderful reflections. @john4jack: Hey Jack! Thasnk very much sir - you are the tops! Incredible photo! I really love it. You've been posting some really great ones while I was gone on holidays. @Andrea: Hi Andrea - Thank you very much - I hope you had fun! !